Ben, lecturer and course manager for FE Horticulture at the College, who specialises in construction and design, has designed several show gardens for the RHS Chelsea Flower Shows. He said: "This really is a fantastic achievement for our horticulture students. We have come close in previous years but this team have really raised the bar with their attention to detail, creativity, horticultural flair and sheer determination. It has been a tiring few days but it was all worth it to gain national recognition at the Ideal Home Show - I am thrilled for them!" The theme was reclaimed urban space and the team created a pub that had been taken over and adapted by nature. The leaf of the bar became a gate, a piano became a water feature, the beer barrels were filled with peat, Jack Daniels became Jack's Beanstalk, shelves became bug hotels, pint glasses were filled with compost topped with vermiculite. Vegetables and plants carpeted the floor between floorboards, and crumbling brick walls surrounded the structure with remnants of old wallpaper and plaster peeling in the shape of East Anglia. Abigail Hume, 17, from Colchester, said: "The enthusiasm and energy of the team has been brilliant. I never thought when I enrolled on this course at Writtle College that within less than two years I would be capable of making a gold-winning show garden. We've had the chance to develop our skills by working creatively to a real brief and we've all learnt from the tutors’ experience! It will be a wonderful addition to all our CVs and an experience I will never forget - I'm really looking forward to hearing what the thousands of visitors think of the garden." The competition showcases Britain's premier young talented gardeners. The colleges are awarded gold, silver gilt, silver or bronze medals with two further prestigious titles also being awarded for Best At Show and People's Choice. With this year's theme being sustainable urban gardens, the colleges had to follow the organic and sustainable principles promoted by the Prince's Foundation for Building Community, the competition's organisers. A panel led by TV Gardeners David Domoney and Prince's Foundation ambassador Diarmuid Gavin, Edith Platten, from The Prince's Foundation, Carol Paris, Director General from the Horticultural Trade Association, Leigh Morris, President of the Institute of Horticulture, along with Julia Goodwin, Editor of House Beautiful, judged this year's show gardens. David Domoney, organiser of the competition, said: "The designs were all a testament to the hard work that the participants put in, and the judging process was very demanding. The garden from Writtle College used many innovative ideas, which was inspiring - the pub idea outdoors was particularly interesting and quirky. "The competition allows the personalities of the students to shine through in their designs – they are given very tight deadlines to complete their creation to a high professional standard, and it is also a great networking opportunity for them to meet like-minded peers from up and down the country. 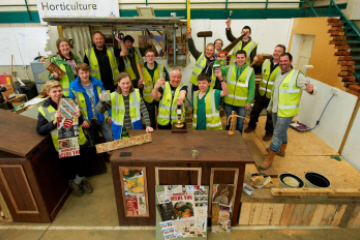 "The Young Gardeners of the Year competition is in its fourth year, and around 250 students took part in this edition. The entries are seen by around 250,000 people at every Ideal Home Show, meaning approximately one million have seen the gardens since its inception." •	The Writtle College team have kindly been supported by local independent builders’ merchants Collier & Catchpole, which has supplied timber, Provender Nurseries, in Swanley, and John Woods Nurseries, Norfolk, which have supplied plants, as well as Carbon Gold, which has provided a specialist soil additive.